Run-of-the-mill cover for a unique romance novel! 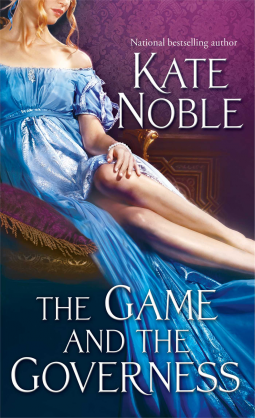 Lessons are learned in Kate Noble’s historical romance, The Game and the Governess. One article led Miss B. to reading it: Jessica’s Book Riot recommendation and one made her think about it, Robin Reader’s DA essay on “Romance and the ‘Meaning of Life’.” Robin Reader’s questions about romance’s reluctance to engage in existential speculation, which centred, in the discussion, on inspirational romance, raised interesting ideas. Miss Bates thinks that romance is even more enjoyable when it implies an ideological basis. And really, is there any way to escape the ideological, even when an author purports that she’s just telling a good romantic story? That, however, is not the job of the author, but the critic, which is why, with Northrop Frye, Miss Bates would agree that criticism can be as “creative” an act as fiction-weaving. Miss B. digresses, as is her wont. Suffice to say for her purpose here that Noble’s romance novel is, like Jane Austen to whom she has been compared (see Jessica’s review), a novel of ideas, interesting, reader-chewable ideas of privilege, class, merit, and personality.